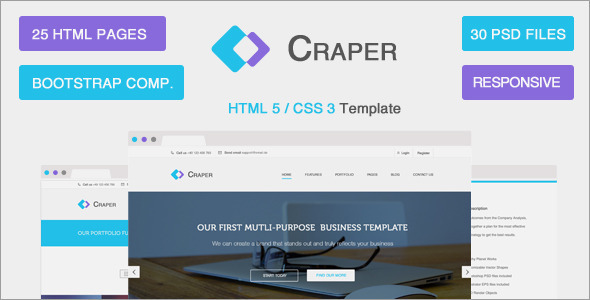 Craper is a clean, Multi-Purpose HTML5 / CSS3 theme is build on a 1170px grid and integrated for Bootstrap 3.1.1. Including a grand total of 25 bootstrap pages, you might use a a lot of amazing features for your own website. Use the Responsive Revolution Slider with tons of unique transition effects, an image preloader, video embedding, autoplay that stops on user interaction and lots of easy to set options to create your own effects. There are 5 different homepage options, 2 about pages, 2 contact pages, 5 blog pages and 9 different portfolio page options. 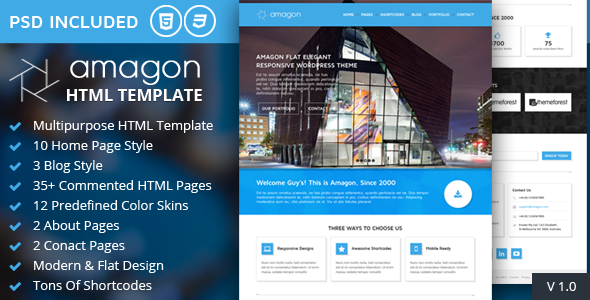 You can easily use all features and widgets of the template and create a complete new website. Start to design you website today!